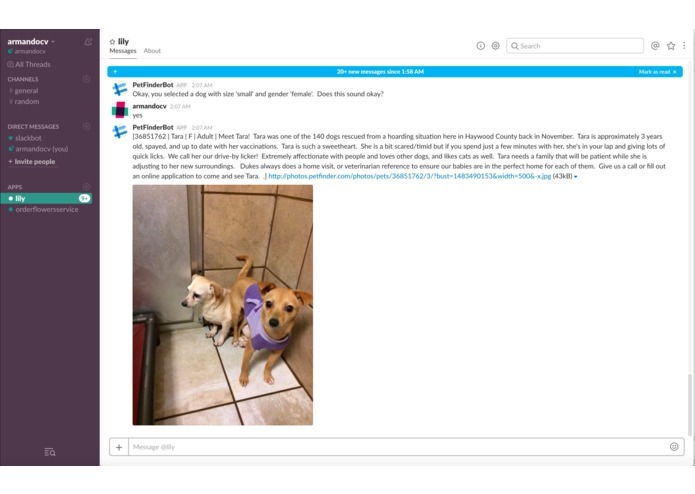 Lily helps connect people with a pet they want to adopt by searching through a pet database. Looking to adopt a dog, for example? Enter location, size and gender to find a dog in your area that is ready for adoption. Lily is a serverless bot. It leverages the following AWS services: Amazon Lex and AWS Lambda. Lily supports the FindPet intent. The Lambda function uses relevant information, such as, location, size and gender to query the pet database. I wanted to use Slack message formatting Slack Message Attachments to display the information in a more readable layout but the content type was causing issues. I've really struggled to find time to work on this project but I was very proud to see it working. Amazon Lex + AWS Lambda empower developers to build chatbots quickly and easily. What I like the most was the ability to access AWS services from the Lambda function and this is controlled by the chatbot. I built this bot in memory of my little dog Lily.